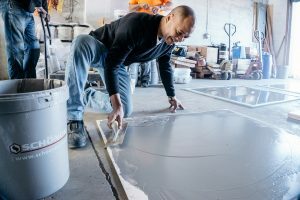 Often the best answer for a challenging subfloor is a self-leveling compound. Schönox HPS North America recently gave our team a live demonstration and review of their products at our Chester, PA facility. 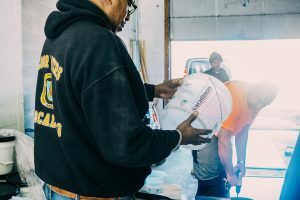 Our team was more than impressed with how easy this product performs, its environmentally sound components as well as the features to keep installers safe. Regional Business Manager of Technical Sales, Bernie Cooper, gave a comprehensive review of their 2 flagship products AP and APF. Here is everything you need to know. The Schönox product combines top speed with results. The product performance has a much higher compressive strength than any of the concrete based competitors because of it’s synthetic gypsum base. 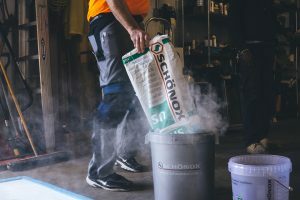 Knowing that in time is money, Schönox product has drying times ranging from 24 hours to as little as 2-3 hours depending on the moisture at on the job site. 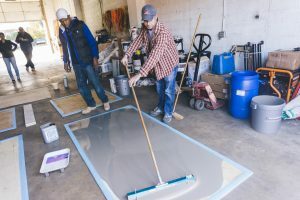 Most self leveling products will create a huge dust cloud when mixing the product causing tiny pieces of cement to fill the breathing air of installers. But with Schönox products, which are essentially dust free and the two flagship products are not cement based, installers can be confident in this minimal emissions product. It’s no wonder Schönox is no stranger to the flooring industry. With their full line of primers, repair mortars, floor leveling compounds, and adhesives you can save time and money. The result is a smooth, sound subfloor ready for flooring installation in less time and prepared in an environmentally-responsible manner. 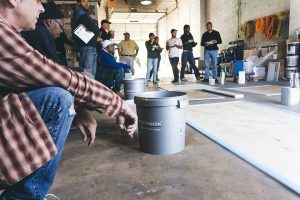 Schönox offers a self-leveling solution that dries in two hours, an option for exterior use, as well as products made with recycled content. Let us know if you need help with your sub floor restoration project by emailing us at info@smithflooringinc.com.